> See here for more discussion on efficient usage. matchers). The weights need to form a commutative semiring (valid for TropicalWeight and LogWeight for instance). < Versions of this operation (not all shown here) accept options that allow choosing the matcher, composition filter, state table and, when delayed, the caching behaviour used by composition. > Versions of this operation (not all shown here) accept options that allow choosing the matcher, composition filter, state table and, when delayed, the caching behavior used by composition. The output labels of the first transducer or the input labels of the second transducer must be sorted (or the FSTs otherwise support appropriate matchers). < The weights need to form a commutative semiring (valid for TropicalWeight and LogWeight). > The weights need to form a commutative semiring (valid for TropicalWeight and LogWeight for instance). Versions of this operation (not all shown here) accept options that allow choosing the matcher, composition filter, state table and, when delayed, the caching behaviour used by composition. where vi = # of states visited, di = maximum out-degree, and mi = maximum multiplicity of the states visited.for the ith FST. < Constant time and space to visit an input state or arc is assumed and exclusive of caching. > Constant time and space to visit an input state or arc is assumed and exclusive of caching. > The weights need to form a commutative semiring (valid for TropicalWeight and LogWeight). transduces y to z with weight b, then their composition transduces string x to z with weight a ⊗ b. < The output labels of the first transducer or the input labels of the second transducer must be sorted. > The output labels of the first transducer or the input labels of the second transducer must be sorted (or the FSTs otherwise support appropriate matchers). The weights need to form a commutative semiring (valid for TropicalWeight and LogWeight). < string x to z with weight Times(x, z). > string x to z with weight a ⊗ b. The output labels of the first transducer or the input labels of the second transducer must be sorted. The weights need to form a commutative semiring (valid for TropicalWeight and LogWeight). the choice of which tnansducer is sorted - prefer sorting the FST that has the greater average out-degree. 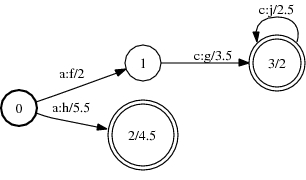 the presence and location of epsilon transitions - avoid epsilon transitions on the output side of the first transducer or the input side of the second transducer or prefer placing them later in a path since they delay matching and can introduce non-coaccessible states and transitions. where Vi = # of states and Di = maximum out-degree for the ith FST. < where vi = # of states visited and di = maximum out-degree of the states visited.for the ith FST. > where vi = # of states visited, di = maximum out-degree, and mi = maximum multiplicity of the states visited.for the ith FST. Constant time and space to visit an input state or arc is assumed and exclusive of caching. < states visited.for the ith FST and constant time to visit an input state or arc is assumed. > states visited.for the ith FST. 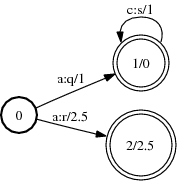 Constant time and space to visit an input state or arc is assumed and exclusive of caching. < states visited.for the ith FST and assuming constant time to visit an input state or arc. > states visited.for the ith FST and constant time to visit an input state or arc is assumed. > Compose: O(V1 V2 D1 log D2), where Vi = # of states and Di = maximum out-degree for the ith FST. assuming constant time to visit an input state or arc. where vi = # of states visited and di = maximum out-degree of the states visited.for the ith FST and assuming constant time to visit an input state or arc. attr="" autoattached="1" comment="" date="1182462230" name="compose2.jpg" path="compose2.jpg" size="8826" user="Main.MichaelRiley" version="6"
attr="" autoattached="1" comment="" date="1182462230" name="compose1.jpg" path="compose1.jpg" size="7902" user="Main.MichaelRiley" version="1"
attr="" autoattached="1" comment="" date="1182462230" name="compose3.jpg" path="compose3.jpg" size="10184" user="Main.MichaelRiley" version="5"
attr="" autoattached="1" comment="" date="1183240071" name="compose3.jpg" path="compose3.jpg" size="15164" user="Main.MichaelRiley" version="6"
or the input side of the second transducer or prefer placing them later in a path since they delay matching and can introduce non-coaccessible states and transitions. attr="" autoattached="1" comment="" date="1181964136" name="compose2.jpg" path="compose2.jpg" size="8826" user="Main.MichaelRiley" version="6"
attr="" autoattached="1" comment="" date="1181962547" name="compose1.jpg" path="compose1.jpg" size="7902" user="Main.MichaelRiley" version="1"
attr="" autoattached="1" comment="" date="1181964162" name="compose3.jpg" path="compose3.jpg" size="10184" user="Main.MichaelRiley" version="5"
Traversal: O((nstates1_visited + narcs1_visited) * (nstates2_visited + narcs2_visited)), assuming constant time to visit an input state or arc. transduces y to z with weight b, then their composition transduces string x to z with weight Times(x, z). > The output labels of the first transducer or the input labels of the second transducer must be sorted. This operation omputes the composition of two transducers. If A transduces string x to y with weight a and B transduces y to z with weight b, then their composition transduces string x to z with weight Times(x, z).